Every dive pro has their own, tips and tricks they use on a day to day basis, some are commonly known and others are so obvious you’ll wonder why you didn’t think of it. Either way we’ve compiled a list of tips for diving around Phi Phi Island to help you get the most from your dives and also provide a little extra awareness and safety. Before you dive make sure you wash any sun tan lotion off your face as this will make your mask fog up quickly which although not a huge problem is just annoying! The white (non gel) toothpaste is great for new masks as the mild abrasive quality helps remove a thin filmy layer on the lenses, left over from the manufacturing process. Baby Shampoo is great for a regular use as it both an effective at keeping your lenses clean and it’s no-tears properties means it’s kind to your eyes too! In most parts of the world when you dive from a boat you have to make your way back to the boat which stays stationary during your dive. In Phi Phi and the surrounding areas your boat will come and pick you up! You should be with a Dive Guide (Dive Master or Dive Instructor) who will signal the boat when everyone is ready. But you should always stay with your group and remember what your boat looks like YOURSELF. Obvious I know, but there’s nothing more scary for your dive leader than those two or three seconds from realizing two are people unaccounted for and seeing them waving from another boat! There is one exception, if you look like your struggling in any way the closest boat to you will come to your assistance. Phi Phi’s dive community is a very close one and diver safety is the only rule which has no compromise. One of the most common problems which every diver will experience at some point is equalizing (middle ear squeeze). Which can cause pain in your ears and normally happens within the first 10 meters of descent since this is where the greatest change in pressure occurs. The pain is caused by the difference in pressure between the air spaces of your ears and mask and higher water pressure as you go deeper into the water. Squeezes that affect the inner ear or sinuses are less common. At the first sign of discomfort (before it’s painful) stop your descent signal your dive buddy and dive guide that you have a problem equalizing (you will have been reminded of this hand signal during your dive briefing). Then ascend slightly until the feeling goes away. Gently equalize as normal and start to descend again SLOWLY and equalize more frequently. You can repeat this process as many times as you like until you can complete your descent. BUT DO NOT TRY TO FORCE IT as this rarely works and can cause more discomfort. 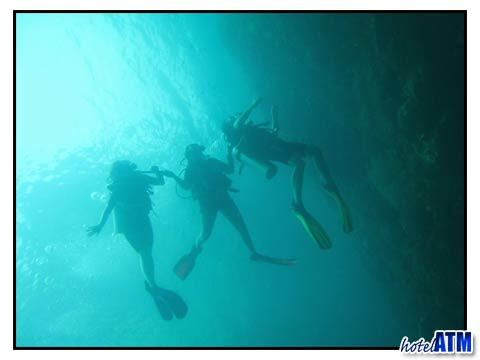 Depending on the dive site it might be possible for you and your buddy to stay at a shallower depth and swim above the rest of the group until you are able to descend. However if the dive site does not permit this and you are unable to continue the dive it’s best to end the dive and return to the boat (with your buddy). Anyone who dives frequently including dive professionals will have done this at one time or another, there’s no shame in ending your dive if you can’t equalize. In fact it’s actually a good sign of a responsible sensible diver. Reverse Squeeze follows the same principles except this time to relieve the pressure you’ll have to descend slightly before making another attempt and ascending. Reverse squeeze is much more uncommon but by following your training should not be any cause for concern. Think slow motion. Diving is relaxing and is certainly not a race, so go slow! Use your hands for signaling and adjusting your equipment, don’t use them to swim with they don’t work effectively. Use slow long kicks to get the maximum from your fins and remember not to bend your knees too much. Buoyancy is also key, if your body position is flat and you have the right amount of weight then you will need less air in your BCD. This makes you much more streamlined and can glide through the water with minimal effort. Open Water Divers should include Peak Performance Buoyancy in their Advanced Open Water Course or if you’re already an Advanced Diver you should consider doing the Peak Performance Buoyancy as a Specialty Course. If you’re really into your Photography then diving with a group probably won’t be your thing. You’ll want to go slower, stop more frequently and for longer periods. If you are an experienced diver and avid photographer it’s recommended you enquire about booking a dive master to be your personal dive buddy. The local Dive Master will be able to point out all the best things to take a picture of like a spotter, they won’t get in your way and you won’t have to worry about staying with the larger group. And just so you know in advance, NO you can not dive on your own. (All the larger boats operating from Phi Phi Island have dry areas for cameras in between dives). When booking a recreational dive you’ll be asked about your level of training and number of dives. This is for your safety. The more inexperienced divers can be kept closer to the Instructors and Dive Masters during the dive in case you need their assistance. Telling them you’ve done a few hundred dives doesn’t help them or you. It’s always obvious how experienced a diver is when you see them set up their gear, pick their weights and prepare for the dive, but it’s easy to find yourself on a dive that you’re not prepared for. If provided with the right information the dive professionals at any of the Phi Phi Dive Centers can recommend suitably challenging and enjoyable dives for the best possible dive experience. An important tip for safe scuba diving is to remain well hydrated so sure to drink plenty of bottled water, get sufficient rest. Everybody wants to have a good time on their holiday, especially when you’re staying on a tropical island like Phi Phi, and for some, that includes alcohol. But if you are going scuba diving, it's a very good idea to limit your alcohol consumption to the minimum, as it leads to dehydration especially when the climate is so hot. Much of the bottled water in Thailand is completely purified; unfortunately this also goes for many of the natural minerals normally found in water. Re-hydration sachets (to mix with water) are usually available on most dive boats but it’s always handy to have a few of your own (the Orange flavored De-Champ is quite nice) available form 7-11’s and pharmacies on Phi Phi Island. One very important scuba diving safety procedure whether you are beach diving or boat diving is scuba diving with boat traffic. Before surfacing from a dive, look and carefully listen for boat engines. When swimming on the surface. Above all, never attempt to swim back to your dive boat from underwater. Slowly ascend a few yards away from the boat, and approach it on the surface only when you are sure that a crew member has seen you and that the boat is stationary. There’s no excuse for running out of air during your dive. Monitor your air supply regularly, signal your buddy to do the same and let each other know how much air you have left at regular intervals throughout the dive. Your Dive Master will also ask you how much air you have during the dive (by pointing at their own air gauge and then pointing at you). It’s a good idea to also let the dive leader know when you have half a tank (100 Bar) as this may affect the route you take on the dive, because of this it’s normally included in the dive briefing but all too often forgotten by divers. The beach and reef dives around Phi Phi will usually have a 50 bar minimum, so when you get to this point you should inform your dive guide and buddy so they can assess when and where the group will start their ascent and perform the safety stop. During your dive briefing you will also be advised at what point to notify your dive leader that you are running low on air, for example on King Cruiser wreck dive this might be 60 Bar or even 90 Bar (depending on conditions and group experience) since it’s a deep dive (over 18 Meters) and you will use a Descent / Ascent line from the Bow of the wreck and need to ensure you have enough air to get back to the line and make your slow ascent. ALL the dive sites on and around Phi Phi Island are protected National Parks. This means No Spear Fishing and No collecting Shells or Coral as souvenirs. As a general rule it’s best not to touch anything which includes grabbing and standing on coral as this causes them to scar and eventually can lead to their destruction. There are stories of Titan Trigger fish that have been known to chase away divers although at worst it makes for a very funny story. So it’s definitely nothing to be concerned about in Phi Phi as most of the Thailand related stories of this nature come from the Gulf of Thailand near Koh Tao. 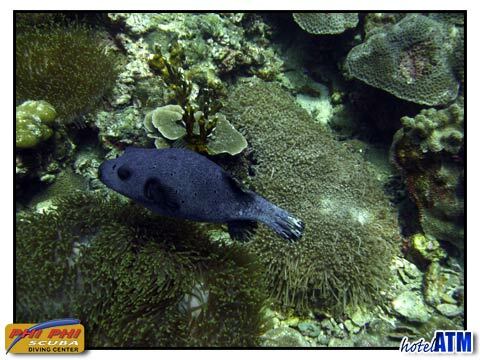 It is true that Titan Trigger Fish can get territorial during their breeding season when they are guarding their nest. Their nest looks like a small crater in the sand and the territory they protect is the shape of an inverted cone (pointy end at the nest) and extends up and out towards the surface. This means that if you ever need to avoid (or evade) any unwanted attention the best course would be stay at your current level (or slightly deeper) and continue on your way. If you’re diving with a wrist mounted dive computer then keep it on your RIGHT arm. This way you’ll ensure you can monitor your depth and ascent rate with ease while your left hand is controlling your buoyancy. When done properly to release air from your BCD you should extend the BCD inflate/ deflate hose vertically (upwards) to allow the air to escape easily. During this action your left arm is raised making any gauges on that arm difficult to read. Most of the Phi Phi Island Dive Centers will be able to rent you a dive computer if you don’t have your own. Although a dive computer is not a replacement for planning your dive using the dive tables as you’ve been taught and you should always know how your dive computer works. Most are very simple to use but for more training you could always opt to take the multilevel and computer diving specialty. On Board - This isn’t a very pleasant one for anyone, but if you’re not great on boats you might want to take a sea sickness tablet before you set off. If you try and take a tablet after you start to feel sick they never seem to work. It’s always a good idea to try one in advance a day or two before to make sure you’re not one of the unlucky minority that experiences any side effects. If you do feel ill while you’re on board you’ll feel much better once you’re in the water. During your dive – The fish love this! It’s definitely not pleasant but it’s also definitely not a problem. Just simply place your hand over your regulator to keep it in your mouth and let your body do what it needs to do. You can always swap over to your alternate regulator while you give your primary regulator a good shake to clear out any bits. Ugh! And after the dive it’s advised to rinse your gear thoroughly. There are many benefits of diving in low season, quiet dive sites, more room on the boats, more one to one time with dive guides and instructors but the waves that can occasionally occur do put some divers off as it can be difficult to get back onto the boat after your dive. Although there’s really no reason to miss out once you know how. After you have completed your dive and need to climb back onto the dive boat when there are waves. Once you grab hold of the ladder, keep your mask on and your regulator in your mouth, whilst holding onto the ladder with one hand release all the air from your BCD with your free hand. This way as the ladder moves up and down through the water you will stay with it making it easier to remove your fins (whilst holding the ladder) and climb out in a controlled, comfortable and relaxing way.